The bobwhite quail, a species that has been on the decline in Arkansas since the 1980s, will have a new opportunity to thrive in north central Arkansas because of a ground-breaking public-private partnership and a $250,000 donation from Southwestern Energy Company. The Damascus Bobwhite Quail Habitat Project was announced Monday by the four partnering organizations responsible for creating the wildlife initiative: the Natural Resources Conservation Service, the Arkansas Game & Fish Commission, Southwestern Energy Company, and the Arkansas Association of Conservation Districts. Covering an estimated 9,700 acres in Conway, Faulkner and Van Buren counties, the project will provide technical and financial support to landowners seeking to create, restore, maintain or manage habitat for bobwhite quail. Landowners interested in participating in this project should call their local USDA Service Center. 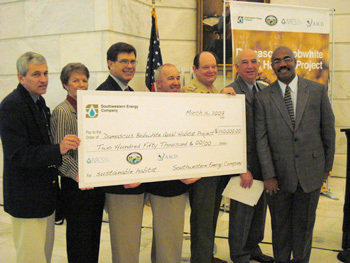 Pictured from left to right: David Goad, deputy director, Arkansas Game and Fish Commission; Ruth Whitaker, state senator from Cedarville and co-chair Arkansas Legislative Sportsmenâ€™s Caucus; Gene Hammons, president, Southwestern Energy Company Midstream Services; Rocky Harrell, Arkansas Association of Conservation Districts central area president; James Hendren, vice president of the Quapaw Area Boy Scouts Council; Mike Burris, state representative from Malvern and co-chair Arkansas Legislative Sportsman's Caucus; Kalven Trice, state conservationist, National Resources Conservation Services.